(CNN) -- Mario Gomez scored all four goals as Stuttgart blasted the Bundesliga title race wide open with a 4-1 victory over leaders Wolfsburg on Saturday. 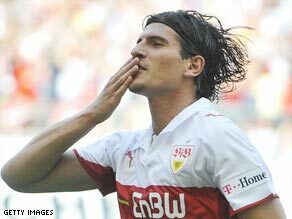 Germany striker Gomez had plenty to celebrate after firing Stuttgart to within two points of the Bundesliga leaders. The Germany striker opened the scoring inside the opening minute and added a second in the 20th minute before Edin Dzeko pulled one back before the break. Two more from Gomez -- taking his tally for the season to 23 -- ended Wolfsburg's hopes of a comeback and boosted Stuttgart's hopes of repeating their late surge to the title from two years ago. "I am just delighted my goals helped the team and keep us in the hunt," said Gomez. "As a successful sportsman you always want the most, but we need to make sure we win all our games now." There are now just two points separating the top four -- Wolfsburg, second-placed Bayern Munich, Hertha Berlin and Stuttgart -- with three games of the season left. Bayern moved level on points with Wolfsburg despite making hard work of their 3-1 win at Energie Cottbus, who remain in the bottom three on goal difference. Jose Sosa's opener was cancelled out by Ivica Iliev two minutes before the break, but two goals in the space of four minutes from Martin Demichelis and Lukas Podolski midway through the second half gave Bayern the points. It could even have been more for Bayern had Franck Ribery not seen his late penalty saved. Hertha Berlin are a point off the pace after cruising to a 2-0 home win over struggling Bochum. Marko Pantelic put the capital club ahead in the 39th minute and Rafael doubled their advantage five minutes after the break. Borussia Dortmund are firmly in the hunt for a Europa League place at the least after they trounced bottom-of-the-table Karlsruhe 4-0 thanks to goals from Jakub Blaszczykowski, Nuri Sahin, Felipe Santana and Alexander Frei. That moved Dortmund up to fifth place -- level on points with Hamburg, and just five points off top spot. Jurgen Klopp's side travel to Wolfsburg on Tuesday. Umit Korkmaz cancelled out Arnold Bruggink's early goal to earn Hannover a 1-1 draw with Eintracht Frankfurt, while Hoffenheim returned to winning ways with a 2-0 victory over Cologne. Sejad Salihovic and Demba Ba were on target in the second half for Ralf Rangnick's men, while Cologne had Youssouf Mohamad sent off in the 78th minute. On Sunday Hamburg face Werder Bremen looking to avenge their UEFA Cup and DFB-Pokal semifinal defeats to their north German rivals and second-bottom Borussia Monchengladbach take on Schalke.